It looks like we may have some beautiful weather for the holiday weekend, and The Mariner Resort is filling up quickly with excited guest ready to celebrate, and with Independence Day just around the corner, I thought it’d be appropriate to do a little research of this nation’s day of independence, and why we celebrate this great day. Until July of 1776, 13 colonies were under the rule of King George III. These colonies were beginning to become dissatisfied with the taxes they had to pay to England. You may remember learning about “Taxation without representation” in high school, meaning these colonies were paying taxes, but had no representation in the English Parliament, and therefore had no say in what decisions were made. In 1774, the first 13 colonies formed the First Continental Congress in Philadelphia, Pennsylvania. In 1775, the King’s troop began to descend on Concord, Massachusetts, where Paul Revere’s famous words were shouted “The British are coming, the British are coming!” This marked the beginning of the struggle for independence, for the next year England and the colonies would struggle to make any agreements. In June of 1776, after all hope was gone for the colonies and England to repair their differences, a committee was formed and created a formal declaration of independence. The committee was headed by Thomas Jefferson and other members included: John Adams, Benjamin Franklin, Robert R. Livingston, and Roger Sherman. On July 4th a vote was taken and 9 out of the 13 colonies voted in favor of the declaration. Although the signing of the document wasn’t official completed until August, the 4th of July has been accepted as the official anniversary of our nations independence. Now with your brief history lesson complete, enjoy your holiday with your families and be safe! Come see us soon at The Mariner Resort! If you are living in or visiting Wells, York, or South Berwick Maine, you may notice some unusual crossing signs. According to the Department of Inland Fisheries and Wildlife and the Nature Conservancy, there are endangered turtles nesting in those areas, the Spotted and Blanding turtles. For Spotted turtles mating occurs from March to May. During June, females leave the wetlands and travel up to a mile to a sunny site with sandy soils to lay a clutch of 3-7 eggs. 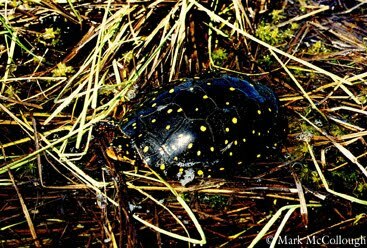 Spotted turtles occasionally nest in natural forest openings, exposed bedrock areas, or sedge hummocks in swamps, but are frequently attracted to yards, pastures, gravel pits, and road edges. Nests are often concentrated in human-created habitats where nest loss may be high from predators or road grading. Incubation time depends on soil temperature, but typically lasts 88-125 days, and hatching occurs in September and October. Eggs may not hatch in cold, wet summers (IFW). Mating season occurs from May to July for Blanding turtles. Nesting usually occurs in mid-June when females move up to one mile from wetlands to search for exposed sunny locations and sandy soils. Prior to human alteration of the landscape, turtles selected forest openings or exposed bedrock areas to nest. Now, most nest in yards, pastures, and along road edges. During nesting excursions, females may remain out of wetlands for 3-17 days. Nest digging is initiated in the evening and completed after dark, and clutches include 5-11 eggs. Nest predation varies, but is usually high and can be 100 percent for some populations in some years. Incubation time is dependent on soil temperature, but typically lasts 68-118 days, and hatching occurs from late August to October. 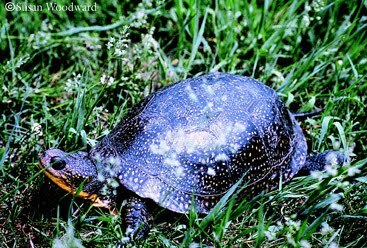 Hatchlings likely happen over winter in nearby wetlands (IFW). So when you are staying at The Mariner Resort and visit these areas, be on the look out for these endangered creatures. Information collected from The Department of Inland Fisheries and Wildlife and the Nature Conservancy. Some Interesting Facts about the Atlantic Ocean. 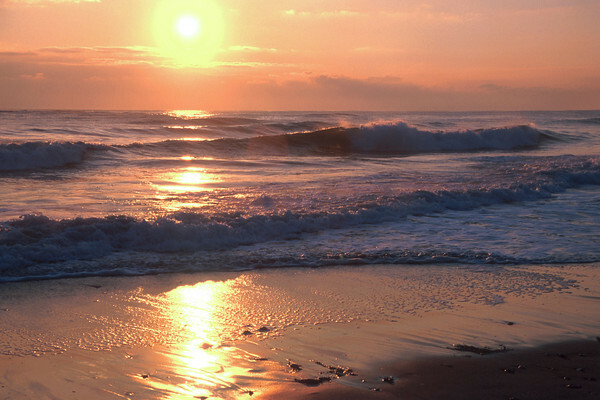 Of all the world's oceans, Atlantic Ocean is the youngest. It is believed to have been formed during the Jurassic Period. Atlantic Ocean receives water from about half the world's land area. Numerous rivers flow into the ocean. The name 'Atlantic' is derived from the legendary island of 'Atlantis', as described by Plato - one of the ancient writers. In South Atlantic, there is a wide stretch of ocean between the tips of South Africa and South America, which causes huge waves & continuous strong winds, known as the "Roaring Forties". The warm Gulf Stream of Atlantic Ocean keeps harbors in the Northern Europe away from ice, during winters. Puerto Rico Trench is the deepest point in Atlantic Ocean. It is about eight and a half thousand meters deep. The largest island in Atlantic Ocean is Greenland. The Cancun reef of Atlantic Ocean, off the coast of Yucatan (Mexico), is the world's second largest barrier reef, after the Great Barrier Reef of Australia. The first successful telegraph cable was laid under Atlantic Ocean in 1866, by The Great Eastern, the then world's largest ship. In World War II, the Queen Mary and Queen Elizabeth carried US troops across the Atlantic, to Europe. Concorde, the first supersonic flight, was across Atlantic Ocean only. In the winter storms of the Atlantic, waves can reach a great size and do untold damage to land. Atlantic Ridge, the underwater mountain range which runs 10,000 miles south from Iceland, is twice as wide as the Andes Mountains. Diamonds are scooped from the sea bed off the coast of Namibia, in southern Africa. A triangular area in Atlantic Ocean, called The Bermuda Triangle, is held responsible for mysterious shipwrecks, disappearances and air crashes. It was in 1919 that the first non stop flight to Atlantic Ocean was taken by John Alcock and Arthur Brown. The journey was completed in sixteen and a half hours. In 1928, Amelia Earhart was the first woman to fly across the Atlantic. Titanic, the largest ship in the world - when she was built and said to be unsinkable, sank in Atlantic Ocean in 1912, after being hit by an iceberg on her maiden voyage to America. In 1938, a coelacanth, a type of fish that first appeared in the sea some 300 million years ago, was caught alive by the fishermen off the Southern coast of Africa. These fishes were thought to be extinct for more than 60 million years. French Emperor Napoleon, after losing the Battle of Trafalgar, was exiled to St. Helena in Atlantic Ocean. So when you are staying with us at The Mariner Resort, stare out at the beauty of the Atlantic Ocean, and think about how much history those waters hold. 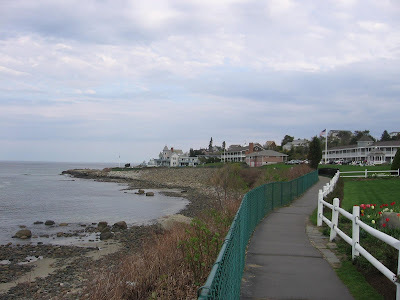 A little background about The Marginal Way. 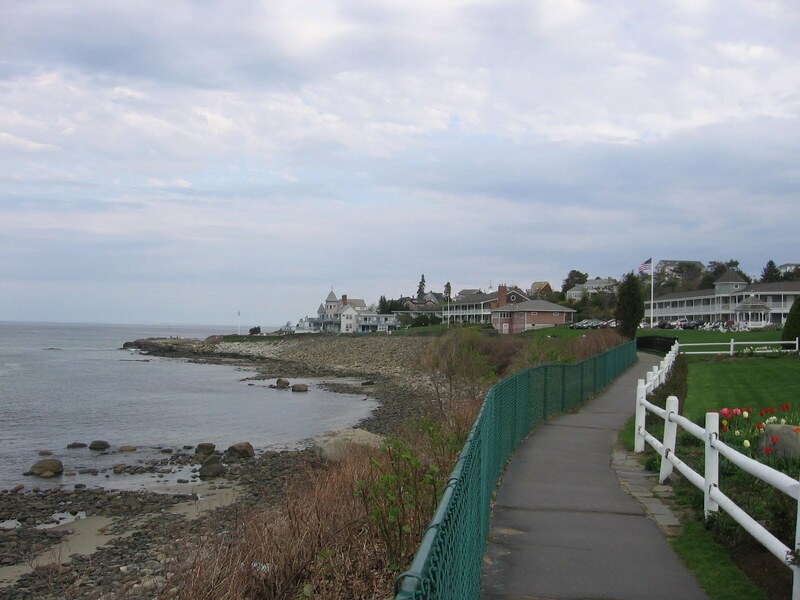 Many who stay with us at The Mariner Resort, enjoy this beautiful walk on Marginal Way. Do you know what a Piping Plover is? The piping plover (Charadrius melodus), is an endangered species named for its melodic mating call, it is a small, pale-colored North American shorebird. The bird's light sand-colored plumage blends in with the sandy beaches and shorelines which are its primary habitat. It weighs 1-2 ounces (43-63 grams) and is 6-6 ½ inches (17-18 centimeters) long. During the breeding season the legs are bright orange and the short stout bill is orange with a black tip. There are two single dark bands, one around the neck and one across the forehead between the eyes. Plumage and leg color help distinguish this bird from other plovers. The female's neck band is often incomplete and is usually thinner than the male's neck band. In winter, the bill turns black, the legs remain orange but pale, and the black plumage bands on the head and neck are lost. Chicks have speckled gray, buff, and brown down, black beaks, orange legs, and a white collar around the neck. Juveniles resemble wintering adults and obtain their adult plumage the spring after they fledge. So come stay with us at The Mariner Resort, and see if you can spot any piping plovers on our beaches in Ogunquit.